Blueberries go on sale locally around early summer/late fall. I like to buy them in bulk and freeze them in freezer bags to use all year round. Last year I stocked up when they were $0.99 a pint at the grocery stores. 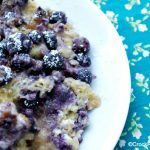 There are a bunch of ways to use fresh or frozen blueberries and I decided that a breakfast casserole would taste great AND be easy to make. You can get this casserole prepared in the slow cooker ahead of time the night before, bring it out in the morning and turn it on to cook. It does need to cook for about 4 – 5 hours, so you will either need to get up early OR have it for bunch later in the morning. You can also cook it the night before, say between dinner and bedtime and serve it in the morning. 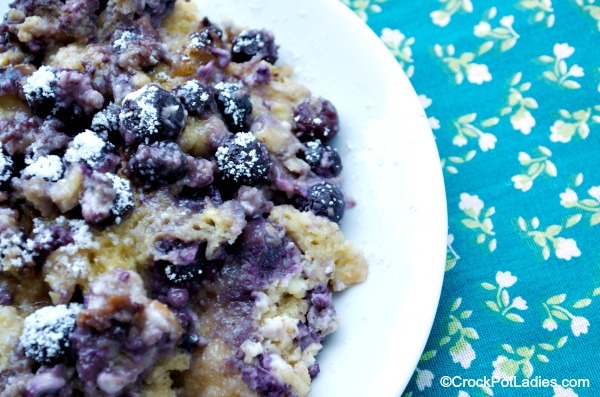 What I personally do is get up early on a Sunday morning, get this blueberry casserole in the slow cooker and let it cook while we are at church. When we get home the house smells amazing and we sit down for a nice brunch. I might make up some scrambled eggs and set out some sliced fruit and juice and it is the perfect Sunday brunch. 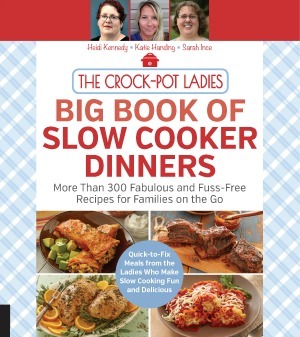 Follow Crock-Pot Ladies on Pinterest for more easy slow cooker recipes! 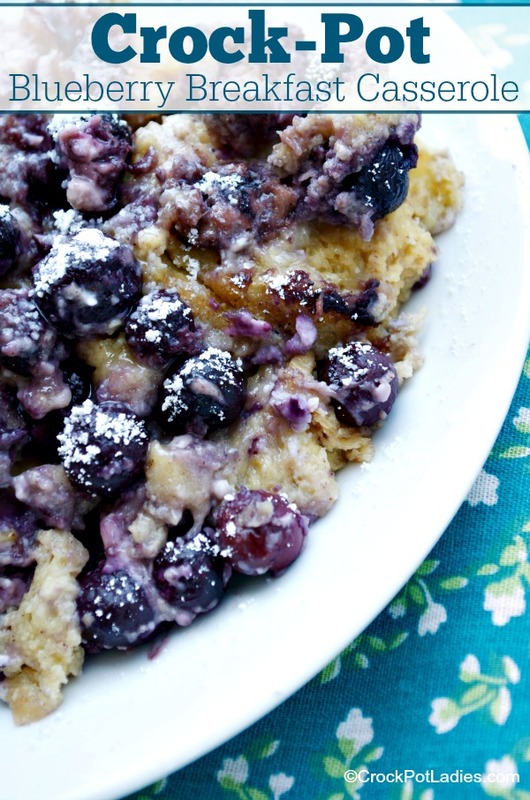 Fresh or frozen blueberries are transformed into a delicious and easy to make breakfast casserole. You can prep everything the night before right in the slow cooker. Line a 5 quart or larger slow cooker with a slow cooker liner or spray the inside of the slow cooker with non-stick cooking spray to make clean up easier (optional). Add in the cubed french bread. Sprinkle the blueberries on top of the bread pieces. In a bowl using a hand mixer, mix the remaining ingredients together. Pour this mixture on top of the bread and blueberries. Cover and cook on LOW for 4 - 5 hours. either or would work fine! Yes it should work the same. As I followed instructions exactly this was a flop and waste of money. Bad idea in my view. Sorry. No stars. Sorry it didn’t turn out OK for you Tucker…not sure how to help diagnose what may have went wrong without better details. Do you have to use cream cheese and sour cream? Any substitutions? We have not tested this recipe without the cream cheese and sour cream. What did you sprinkle over top of this when it’s all finished cooking? That is just a little powdered sugar (confectioners sugar) Meg. Unless I’m wrong (and boy THAT happens frequently enough ) the video doesn’t show the cream cheese being added in. Would you put it in the dish with thefrench bread or mix it in the bowl with the eggs? Hi Monique, The bread and blueberries are added to the slow cooker first. Then all of the remaining ingredients (cream cheese, sour cream, brown sugar, milk, maple syrup, eggs, vanilla and cinnamon) are mixed together and then poured over the bread cubes and blueberries and then cooked. Why then would you waste the time to cube the cream cheese? I say spread the cubes along with the blueberries. COUld the brown sugar be replaced by agave by chance? IF so, how much? Could this be done in the oven? If so How long? This recipe has not been tested in the oven. This looks easy to make and look at those blueberries! It still looks so fresh even when you’ve already cooked it in crock pot. Ill try this with a mix of raspberries too! Thanks Kit. I hope you enjoy the recipe. Raspberries would be delicious I am sure!